Budweiser raises a glass to those who have raised the bar. Just two years ago, the Vegas Golden Knights were just an idea and, understandably, very little was expected of the team in its inaugural season. While the Knights didn’t end the season with the Cup, the team rewrote NHL history and became the first expansion team to reach the Stanley Cup Final in 50 years. 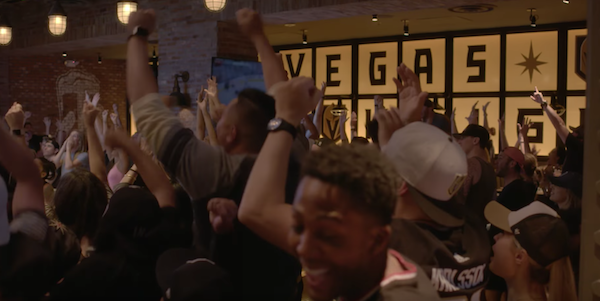 We wanted to share a new Budweiser video celebrating the Golden Knights’ incredible season called “500 to 1: This Bud’s For Vegas.” The video walks viewers through the team’s improbable journey and path to the Cup. The spot is set to “Shot At the Night” by the Killers, reinforcing its connection to Las Vegas. The King of Beers proudly raises a glass to those who have raised the bar and celebrates a team that defied the odds all season, proudly supported by its city. Print article This entry was posted by Art Eddy III on June 8, 2018 at 8:29 am, and is filed under Sports. Follow any responses to this post through RSS 2.0. Both comments and pings are currently closed.